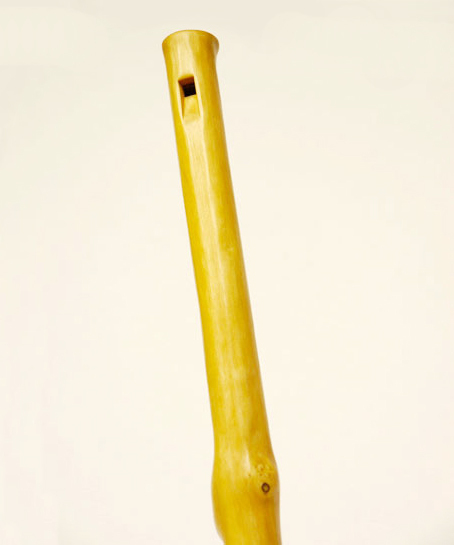 The overtone flute can be found in the Balkan region, Slovakia, and Poland, where it is called Koncovca. In the Scandinavian region the flute is also played, and is called Selyefloyte. Similar to these flutes, though much bigger ,are the Sepic flutes of the indigenous people of South America. The overtone flutes on offer here are of the Koncovca type, with a precisely made fipple, so no special embouchure (blowing technique) is needed. These flutes are made of single branches, mostly of elder. The center of the wood is drilled with special drills, taking out the core, and leaving the branch structure intact. By opening and closing the end of the tube with one finger tip, (the middle finger is best, while holding the flute between thumb and ring finger) and applying more air pressure each time, a simple harmonic scale can be played. Improvisation on a big overtone 'branch flute'. Solid piece of hand-drilled Elder wood, oil and resin finish. 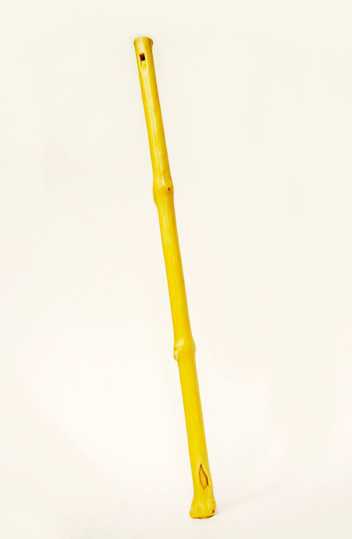 A similar flute can be seen in the video above. Solid piece of hand-drilled Elder wood, 18-layered hand polish finish. Solid piece of hand-drilled Elder wood. 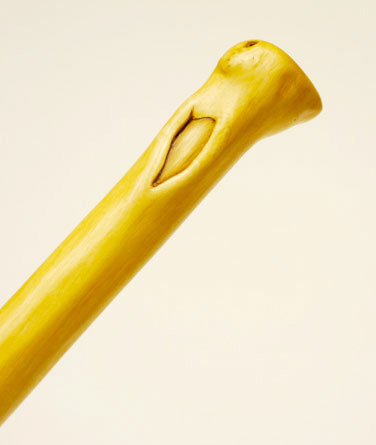 Hazel handle set on solid piece of hand-drilled Elder wood, with 18-layered hand-polished finish. Additional wooden plug with cork seal to close the end of the flute before walking. Solid piece of hand-drilled Rosewood, natural finish. Solid piece of hand-drilled Elder wood, natural finish. Additional 1-step tone hole, solid piece of hand-drilled Elder wood, 18-layered dark hand-polished finish. This flute can be seen in the video above. Additional 1-step tone hole and round fipple, solid piece of hand-drilled Rosewood. Large overtone flute with 3 additional holes at the side, and wooden ring set in the end of the bore. Solid hand-drilled Elder wood. Can be played as a simple overtone flute, one-holed overtone flute or small Fujara. Leather straps can be applied to close the holes depending on how you want to use it. They can also be closed with one hand while the other hand holds the flute, when playing as a normal overtone or one-holed one.